Hyundai’s drive from budget maker to mainstream acceptability was signalled impressively when it introduced the Santa Fe in 2007. A big, well-built and comfortable SUV it’s only available with turbodiesel engines of 2.0- and 2.2-litre capacities. Five or seven seats are offered too, giving this big 4x4 real, rounded family appeal. Keenly priced new they’re a very desirable used buy, not least as most will still be covered by Hyundai’s comprehensive five-year 'Triple Care' warranty. If anyone has any doubts that Hyundai has reached mainstream respectability then they should take a look at the Santa Fe. Build, fit and finish and materials are up with the best of its Japanese competition, while pricing and equipment levels remain highly competitive. What’s good new translates to a great used purchase, the Santa Fe sought after for its rounded appeal and value. Introduced in 2007 the majority will still be within Hyundai’s five-year warranty, giving even greater peace of mind to the used buyer. Two engines, two trims and two transmissions are offered. At its most basic is the 2.0-litre CRDi two-wheel drive 150hp Classic, which makes do with manual air conditioning and does without front fog lamps, cruise control and some leather on the steering wheel and gear knob. Comfort spec adds all of that, along with climate control. It’s also available with four-wheel drive in Comfort 2.0 spec. The range-topping 2.2 CRDi gets all of that, plus more power and a six-speed automatic transmission. All drive decently, but the engines can be a touch unrefined and you’ll want the bigger output if you’re planning on towing anything with it. If you’re buying the Santa Fe because you really need it then the 4x4 model is the one to go for. That means the bigger 2.2-litre turbodiesel is the choice too, mated to an automatic transmission. Find one like that and you’ll have a very useful, practical and comfortable family car that’ll get you pretty much anywhere you like. Despite being around since 2007 it still looks good too, and equipment levels will be comprehensive. A big, neatly styled, well-equipped SUV that comes with the back-up of Hyundai’s brilliant five-year warranty - covering the majority of used buys. 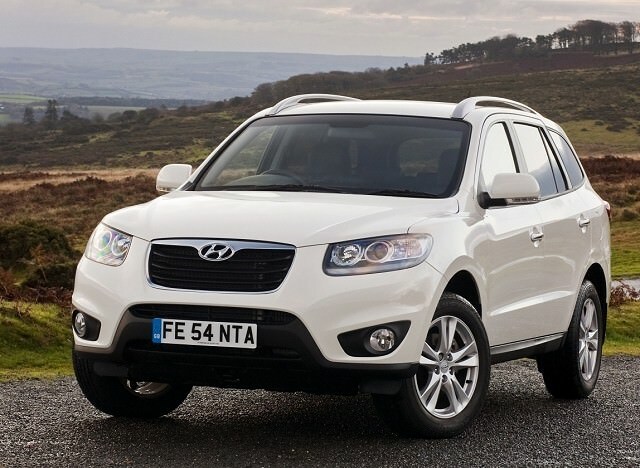 That makes the Santa Fe a very attractive second-hand purchase, and thanks to their popularity new there’s a decent selection to choose from. Find the one that suits you and it’ll better cars like the Toyota RAV4 and Honda CR-V for practicality, if not outright badge appeal.